I realize Mandela passed away last night, and his life and death will have a stranglehold over the media today, but I'm vaguely surprised and a little disappointed I haven't seen anything commemorating the Montreal Massacre yet. 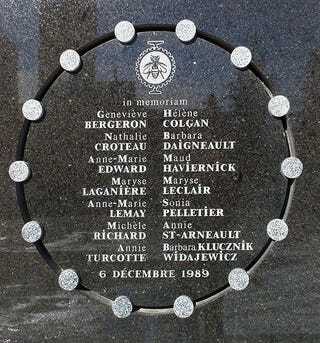 Today marks the 24th anniversary of the murder of 14 young women, all engineering students at the Ecole Polytechnique of University of Montreal. Shot in the name of "fighting feminism," for the crime of being women at an engineering school. The details are easily googlable, and I doubt I can do the event (or the women) justice, so I'll just leave it here. More Chapter Fives Than you Can Shake a Stick At!